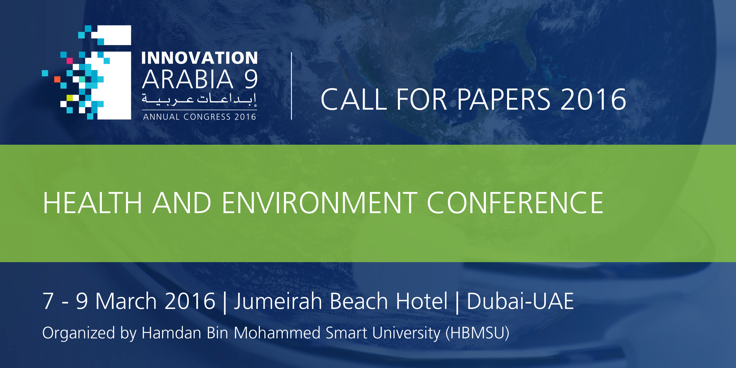 In its 9th edition, Innovation Arabia 9 Congress, under the patronage of His Highness Sheikh Hamdan Bin Mohammed Bin Rashid Al Maktoum, Crown Prince of Dubai and President of HBMSU, showcases leading academic research and the latest practical solutions in three key sectors of development: quality and business management (including Islamic banking and finance), smart learning and education, health and environment. With this year’s main theme “Accelerating Innovation towards Sustainable Economy”, Innovation Arabia 9 Congress reflects the belief that innovation is the path towards growth, progress and a better tomorrow for the Arab World. The Health and Environment Conference held under Innovation Arabia 9 specifically focuses on the conception, understanding, and implementation of innovative interventions in both health and environmental sectors. The health and environment tracks address the challenges in adopting and implementing innovative interventions and delivers a consortium to appreciate the changes in the healthcare and environmental models, keeping in view the environmental changes’ appreciation and apprehensions in the UAE and globally, in particular, to promote a better quality of life.